p A tapestry of Louis and Zelie Martin, parents of St. Therese of Lisieux, hangs from a balcony as Pope Francis leads the Oct. 18 Mass for their canonization. VATICAN CITY (CNS) – Pope Francis called on people to replace their thirst for power with the joy of quiet and humble service, as he proclaimed four new saints, including the parents of St. Therese of Lisieux. 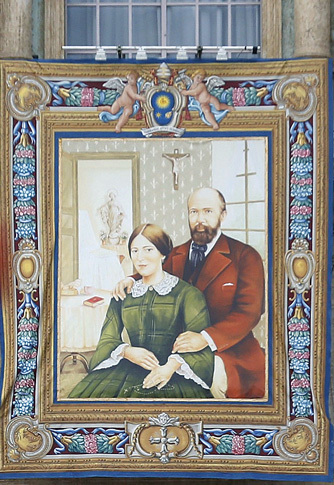 Louis Martin (1823-1894) and Marie Zelie Guerin Martin (1831-1877), the French parents of St. Therese of Lisieux. They had nine children; four died in infancy and five entered religious life. During their 19-year marriage, the couple was known to attend Mass daily, pray and fast, respect the Sabbath, visit the elderly and the sick and welcome the poor into their home. Italian Father Vincenzo Grossi (1845-1917), founder of the Institute of the Daughters of the Oratory. Spanish Sister Maria of the Immaculate Conception (1926-1998), a member of the Congregation of the Sisters of the Company of the Cross. Because Jesus fully shares in the human condition, with the exception of sin, He can empathize with human weaknesses, the pope said.